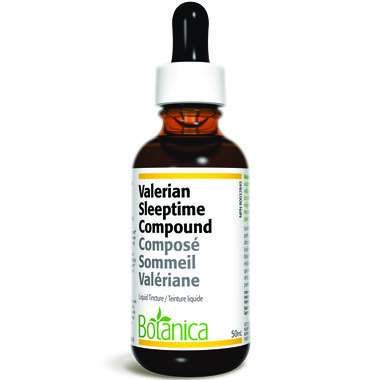 Botanica Valerian Sleeptime Compound is a general sedative formula useful in mild to moderate cases of insomnia, restlessness, anxiety, tension, and headaches associated with tobacco or caffeine withdrawal. Valerian Sleeptime Compound has antispasmodic and mild anodyne (pain relieving) activity. It can be useful for muscle spasms, tension headaches and back pain, as well as palsies and tremors associated with Parkinson's disease, Bell's palsy and trigeminal neuralgia. Directions: For insomnia 40-80 drops (2-4 mL) take in the evening (ideally in Chamomile tea) while symptoms persist. For general anxiety or withdrawal 30-40 drops (1.5-2 mL) taken 3 times per day. Ingredients: Fresh Skullcap herb (Scutellaria lateriflora), fresh Oat milky seed (Avena sativa), fresh Hops strobiles (Humulus lupulus), fresh Passionflower herb (Passiflora incarnata), fresh Valerian root (Valariana officinale) and fresh wildcrafted California Poppy whole plant (Eschscholzia californica). Non-medicinal ingredients: Alcohol, distilled water.